I was born in Exeter and grew up in Lyme Regis. My parents ran a restaurant, where I first experienced the buzz of a busy Restaurant Kitchen, this was the beginning of my culinary journey. During my studies at Exeter College I won the ‘student chef of the south west’ award, going on to become an advanced patisserie chef. My first position after my studies was at the Arundel Arms, a hotel offering fly fishing and country pursuits near Launceston. With three rosettes, fish and game was the culinary theme, with fly rod caught salmon and trout as well as freshly shot snipe and woodcock all on the menu. I went on to work at Hotel Endsleigh, owned by Alex Polizzi – known for her high standards. Here I honed my fine dining skills, cooking for celebrities including Steven Spielberg among others. I gained experience and a greater understanding of the importance of locally and sustainably produced ingredients, when working for four years at Hugh Fearnely-Whittingstall’s River Cottage Canteen. 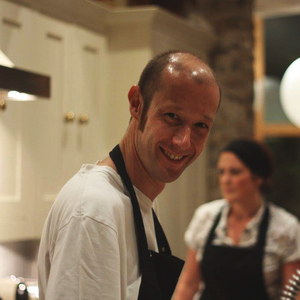 I have extensive experience in wedding catering whilst working at the likes of Langdon court and St Mellion golf resort, whilst also gaining experience for private fine-dining events and weddings alike. I would now love to pass this wealth of knowledge on to my guests by giving you the best experience possible in exceptional dining provided by Creative catering.